If you are not familiar with Chinese painting, I recommend that you view the collection of Chinese paintings at the Stanford University Cantor Art Museum, http://museum.stanford.edu/, which currently has a spectacular display of artists from contemporary China: Wu Changshuo (1844–1927), Qi Baishi (1864–1957), Huang Binhong (1865–1955), and Pan Tianshou (1897–1971). There is an English museum book, as well, called, “Tracing the Past, Drawing the Future”, edited by Xianneng Yang with four hundred pages of reproductions and commentary by four Chinese expert art historians and a Western one. The color reproductions are outstanding; each painting has a translation of the poem with sophisticated commentary. The book was published in Milan, Italy. By viewing the art of others, we learn about ourselves. 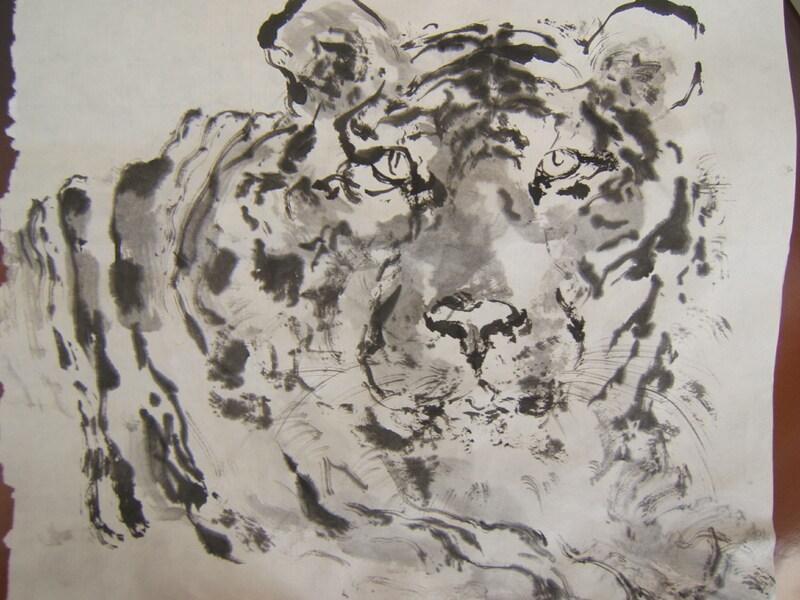 Chinese brush painting has been my hobby since 1974. While Western artists painted Christian religious symbols such as the Virgin Mary, Chinese artists use their language to make puns, which accounts for some Chinese symbols. For instance, a crab represents achieving first place in the Imperial exams. A red and green peach symbolizes yin/yang, male and female forces in the cosmos. “All of Chinese traditional painting is symbolic, but one must know the language in many cases to get the meaning,” said my University of Hawaii Chinese Philosophy Professor Chang. “Lotus and the moon are perhaps the most famous symbols,” he said. Chinese artists loved to lament the passing of the seasons; they wrote poetry to the moon or to their lost love. Then, their poem was handwritten on the side of the painting after they finished it. “Poetry is painting and painting is poetry, ” as the scholars of China say. In 1936, Chiang Yee, a noted poet, calligrapher, and writer, published a book in English called The Chinese Eye . Professor Chiang was a chemist trained at Nanjing University. He lived in Europe and America, writing and illustrating a number of Silent Traveler books including one on San Francisco. As Chiang writes about our differing attitudes, East and West, he uses the metaphor of tea to discuss Chinese painting; the British put milk and sugar in their tea, in other words, they “decorate” their tea, says Chiang Yee. They accompany tea with sweets. They drink tea for refreshment—a practical goal. However, Chiang remarks that the Chinese view is that tea is valued for its “natural fragrance, its gentle taste, and purity on the palate.” Tea drinking is a sociable event. Tea is sipped. How does this relate to Chinese painting? Instead of walking quickly through the Stanford Canter Gallery, I invite you to take your time to see just one painting slowly. Admire the energy of Wu Changshuo, Pan Tianshou or Qi Baishih’s strength of ink lines, as they experimented with new brush work. Wu was a master rock carver of stamps so he tried to achieve a carved feeling in his lines. Man exists in their art as merely a small part of the whole or with lots of white space around each image such as the portraits. Who were these artists? Chinese brush artists were traditionally well-educated in calligraphy, composing poetry, carving stamps, and memorizing Confucian classics according to our museum guide. These literati painters became bureaucrats after passing their rigorous Imperial exams, so they painted in their free time. Traditional artists worked in the far away capitol or hinterlands, so these scholars became homesick for their villages. They created scenes of flowers, birds, mountains and waterfalls from memory. However, these modern artists at the Cantor Gallery often studied abroad where they were exposed to Japanese and European art. Since world powers were busy ‘carving up the Chinese melon’, as historians say, taking China’s ports through wars and treaties, these artists felt acutely that their country was weak. A crisis in the Chinese art world was brewing. Should they continue to study the masters of old in the same methodology of the past, or should they throw out Chinese brush work and try to develop something new? These masters decided to keep Chinese brush ink line and traditions but push their individuality and personal expressiveness to new heights. Now we look on these works on display here as examples of artists who were pioneers of modern brush painting. These literati paintings were usually not for sale by their creators in the old days. Their art was mounted onto a scroll, given to a scholar friend, or unrolled slowly over a cup of tea, as if to take a mental vacation. To be sure, artists in China have sold their work to survive, but this custom was frowned upon. So we learn that the traditional Chinese literati painter was an amateur. They were not encouraged to sell because art reflects the soul and “the soul is not for sale”, says Chiang Yee. “No good pictures can have a cash value…even the thought of fine paintings falling into the hands of people with money but no soul was distasteful,” according to Chiang Yee. Thus, for a thousand years or more, Chinese scholar artists tried to avoid selling their paintings to the rich, that is, unless the artist worked for the Emperor or the court. In this century, paintings have been for sale. The Cantor Gallery art book tells how artists starved before their work came to the attention of the Shanghai art community. Such was the case of Wu Changshuo, for example. Now, EBay has hundreds of Chinese artists selling their work. This telecommunication phenomenon is evidence of how quickly China is modernizing. Western watercolor classes that I have taken are full of elaborate techniques to create effects of light, space, and perspective. By contrast, Chinese brush art is not as much about the final painting evoking the scientific world around us, but, rather, brush art reflects the artist’s inner vitality (chi), soul, and character. Let me explain: if I am in a hurry or inattentive, I guarantee that my brush lines will show the strain in my heart. Or, if I try to copy an Internet photo of a kingfisher too slavishly, my teachers will say, “Let the brush speak….let the brush dance.” According to Xie Hu, the old master who first wrote Chinese Six Principles about how to paint, we are trying to paint the so-called essence or spirit of the bird-ness using a fresh, naïve, almost childlike quality of line. Please forgive me. I would never want to trivialize James John Audubon or Vincent Van Gogh. I simply love the masters at the Cantor Gallery, as well as Ni Tsan, Fan Kuo, and Xu Wei, who inspired the Lingnan School artists like Chao Shao-an at our San Francisco Asian Art Museum. I also admire both “xie yi” (spontaneous, free hand style) and the “gong-bi” (outline or refined ) style painters. At the Stanford show, you will see mostly xie yi style on display. If you take time to travel inside the reserved, sometimes austere, Chinese ink paintings; or view the lush lotus or bird studies, or Buddhist figure art; you may return to these styles of painting forever. If you happen to pick up a brush and take some lessons, you will begin an adventure which will be likely to enrich your ability to live your life with calm intensity while admiring nature and interpreting orchid leaves through ink. Ah, the joyous time I spend studying frogs on a wet reed, a painting by Pan Tianshou, or kingfishers on the open space trails.